Son of Abinadab. Together with his brother Ahio, he drove the new cart on which was placed the Ark of the Covenant when, accompanied by David and all the house of Israel, it was brought from Abinadab's house at Gibeah to Jerusalem. When they came to the thrashing-floor of Nachon, the oxen which drew the cart stumbled, and Uzza took hold of the Ark to steady it; whereupon he was slain by God "'al ha-shal" (= "for his error"). David, in memory of the event, called the place "Perezuzzah" (II Sam. vi. 3-8; I Chron. xiii. 7-11, where the thrashing-floor is called "Chidon"; comp. the commentaries of Budde, Löhr, and Nowack, ad loc.). The Rabbis made various attempts to explain and palliate the death of Uzza. By an "argumentum a majore ad minus" proof is offered that if the Ark could bear those who bore it, so much the more could it bear itself. By not perceiving this, and thinking that the Ark might be prevented from falling by stopping the oxen, Uzza had brought death on himself. R. Johanan thought that "'al ha-shal" implied that he had died as a result of his act, while R. Eleazar drew from "shal" the inference that Uzza had eased himself near the Ark. He was, nevertheless, to share in the world to come: for it is expressly stated that he died "by" the Ark; and as the latter belonged to eternity, Uzza in like manner must be immortal (Soṭah 35a; Yalḳ., I Sam. 142, ed. Wilna, 1898). 2. Grandson of Ehud, and a member of the tribe of Benjamin (I Chron. viii. 7). 3. Head of a family of Nethinim who returned to Jerusalem with Zerubbabel (Ezra ii. 49; Neh. vii. 51). 4. Garden attached to the royal palace. According to Stade, "Gesch. des Volkes Israel," i. 569, ii. 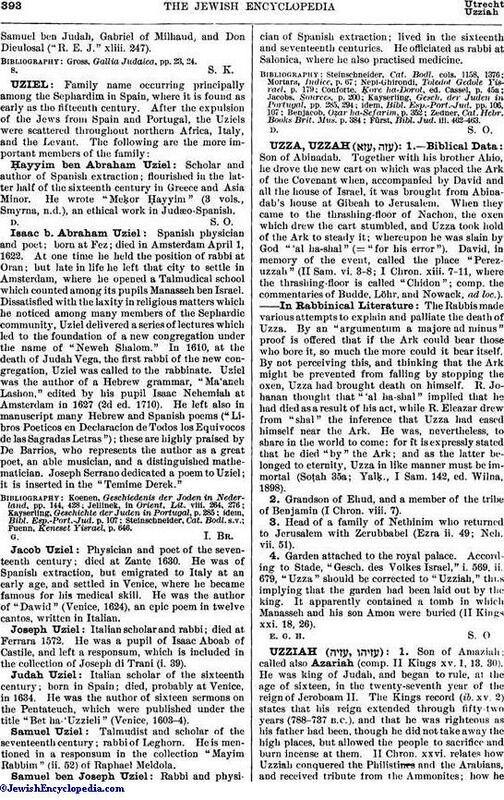 679, "Uzza" should be corrected to "Uzziah," thus implying that the garden had been laid out by the king. It apparently contained a tomb in which Manasseh and his son Amon were buried (II Kings xxi. 18, 26).